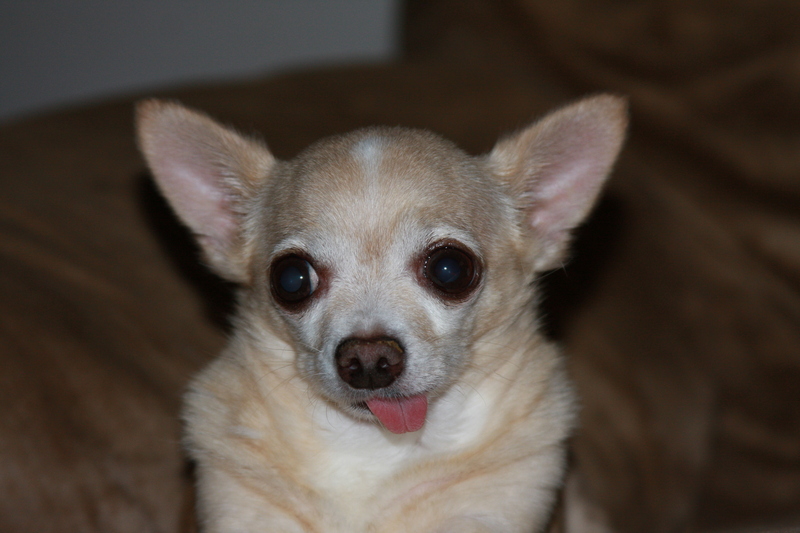 They’re so amazing that even my dog said, “EEEEEEEEEEEE, Chihuahua!! 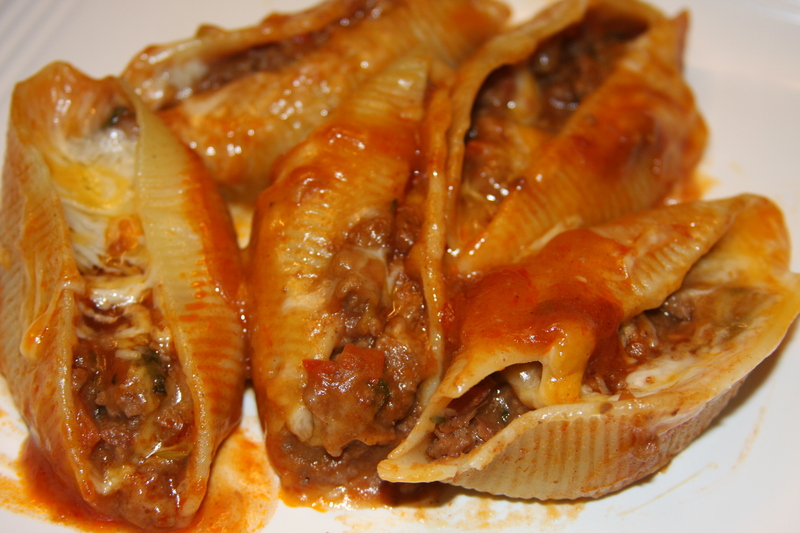 I like the idea of cooking and stuffing these jumbo pasta shells. I just don’t like the way they are normally served because I don’t like ricotta cheese. I figured that there had to be other great flavor combinations out there to make and stuff in these lovely little shells. And if you have other suggestions, I would love to hear them! Since we have been having a lot of Mexican style dishes lately, I decided to stick with that theme. I came up with a plan and they turned out even better than I thought. In fact, the two pickiest eaters in the house had seconds! My teenager has even mentioned them a few more times this week, wondering when I was making them again. That is always a good sign. They also made for great leftovers. I wanted to have them with a little more heat to them, but knew that if I added it, the three year old wouldn’t be able to eat them. So, we topped them with sour cream and doused them in Green Tabasco sauce. If you have never tried the green version, you are missing out for sure. It was amazing on top of these shells and added a really nice flavor. You can definitely add some heat to the meat mixture if you wanted to. I think a jalapeno and some red pepper flakes would make a nice addition as well as the hot enchilada sauce instead of mild that I used. I think the next time I will add a 4 oz. can of chopped green chilies too. ** To make this a vegetarian recipe, just leave out the meat. Cook pasta shells according to package directions. Drain and set aside. 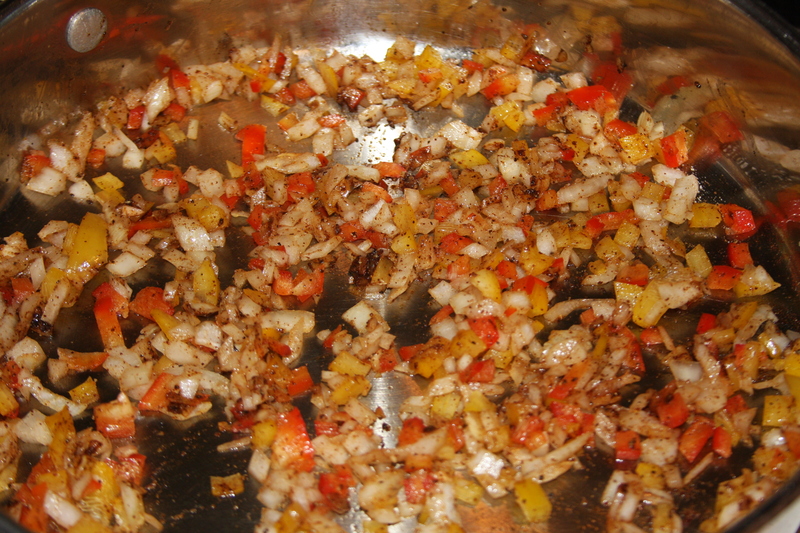 While those are cooking, in a large skillet over medium heat, put in your sweet onion, peppers and seasonings. Stir in your can of re-fried beans and mix it all up. Add your green onions and cilantro and then about 3/4 of one of the cans of enchilada sauce. Let it cook for about another minute or two and then remove from heat. I used an 11 x 13 glass baking dish and sprayed it with non-stick cooking spray. Then I added the remaining 1/4 of the first can of sauce and about 1/4 of the second one to the bottom of that baking dish. Then, open up each cooked pasta shell and fill it up with the meat mixture. Place each shell into the bottom of the dish. I ended up with quite a few leftover shells, so the next time I make it I probably won’t fill them up as full so that I won’t run out of the meat mixture. Place them all close together so you can fit them all in your dish. 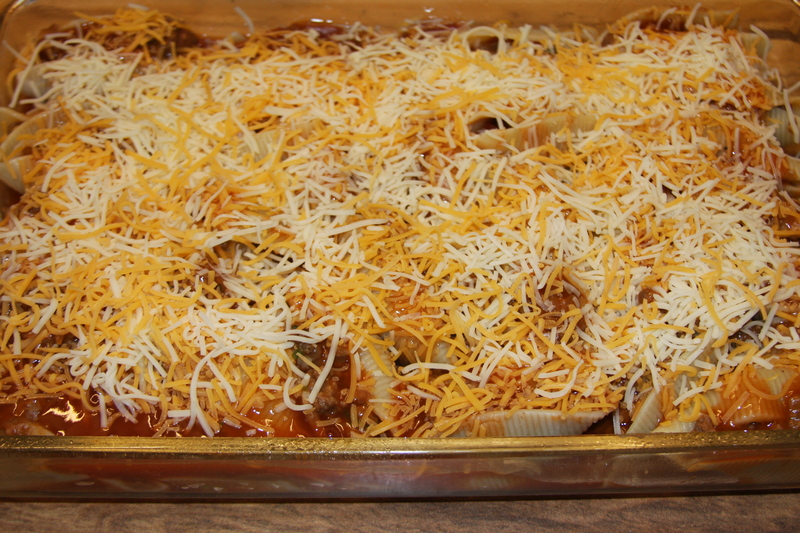 Pour the remaining enchilada sauce evenly over the tops of the shells. Then sprinkle your cheese over the shells. Cover the pan with aluminum foil. Bake at 350 degrees for 25 minutes. Remove the aluminum foil and cook for an additional 5-7 minutes, or until all the cheese is melted. Then top with your favorite toppings. 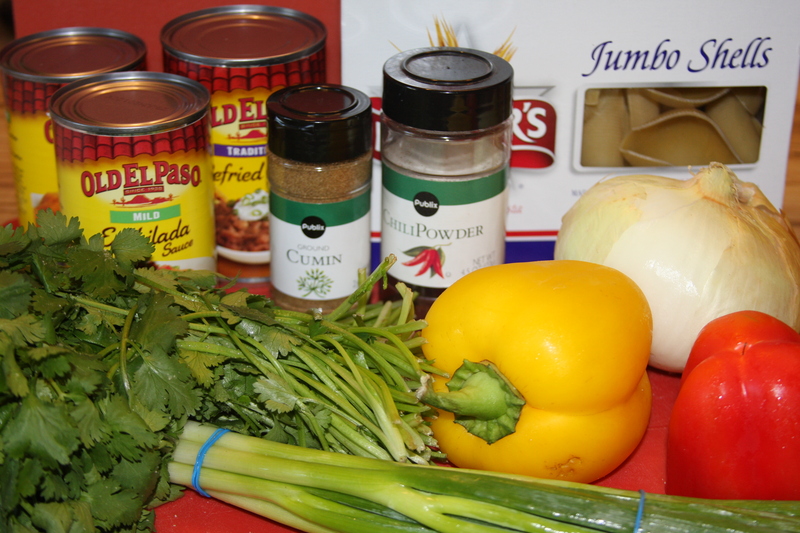 This entry was posted in Beef, Dinner, Gluten-Free, Mexican Inspired, Pasta Dishes, Vegetarian. Bookmark the permalink. The day you posted this one I knew my family would love it! I went to the store on the way home. I was right, it was a successful “experiment,” as my husband calls new recipes. THANKS! YAY!! I am so glad you liked it. I loved that both my kids ate it and asked for more! The great thing about it is that you can make it up and freeze it for an easy weeknight meal. This I know already know is going to be one of our favorites! thanks so much. Gotta go to the store!!! This is SO amazing! In fact, we are having in for dinner tonight too!! This is one dish both of my kids will eat with no complaints. We have to have the green Tabasco sauce with it, though. I just takes the taste right over the edge! I hope you love it, let me know! WE had this for the first time and was loved by all. Thanks so much for the recipe. this is a dish that we can have often and not get tired of. Thanks again!! What type of side dish do you serve with the shells? So far I have made cole slaw, which is so good together. The shells are awesome on their own. but need side dish for company. YES the shells are great for a get together!!! I cannot wait to make the corn casserole with the shells, not only does it sound so good, it looks awesome. Hope mine looks the same. Oh yes, when you tell your story about walking to school, be sure and tell them it was uphill both ways!!! That is what my dad said. It still brings smiles. Thanks and keep up the good work!! HA HA! I will be sure and do that! I love the corn casserole, it is so good. We don’t eat it a lot, but it sure is a good treat when we do have it! Thank you so much!